Orca whale watching off Vancouver Island in British Columbia in Canada. Canada is a great place for whale watching. No mater if you are on the west coast, the east coast or along the St. lawrence River in Quebec. Whale watching in Canada almost gurantees whales. The canadian west coast (British Columbia) is known for the Orca Whales (Killer Whales), while the west coast (Newfoundland) is known for the Humpback whales. In the province of Quebec you may watch for Beluga whales as well as Fin whales. Orca whale playing with fluke along the British Columbia coast in western Canada. Killer Whales, Orca Whales photographed on whale watching tours off Northern Vancouver island in British Columbia, Canada. 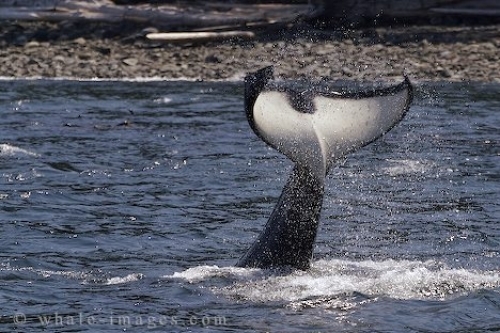 Photo of a Orca Whale fluke taken on a whale watching tour in western Canada.